Skills and Abilities: Proficient hand to hand combatant, tracker, infiltrator and spy. 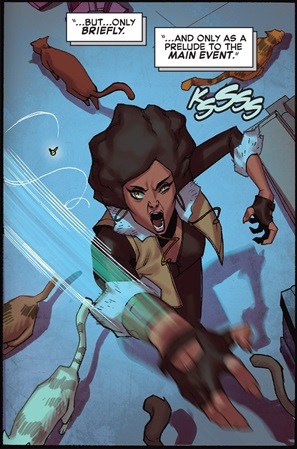 Powers: She can control cats, is invisible to psychics and has a sixth sense to tell when she is in danger. Anais also has incredible agility and reflexes. She is the last survivor of the Saharan Cat people and came to work as a spy and superhero for the french in the Les Heroes de Paris [X-force #4, 2014]. Anais was drawn out by Fantomex after he circulated rumors of terrorist activity in a particular area. Upon confronting her she lead him on a chase through France even having cats attack him at one point. She was shot in the chest by Cable and left dead on the streets [X-force #4, 2014]. Yeah ! she speak french and rock the afro !! Good for me ! !